Visa SavingsEdge is comparable to Plink in the sense that they both earn you extra money on top of credit card rewards and portal bonuses. The only catch with Visa SavingsEdge is that you can only sign up if you have a Visa business credit card. My favorite Visa business cards are the Chase Ink Bold and the Chase Ink Plus. They both offer 50,000 Ultimate Rewards sign up bonuses and they both earn 5X Ultimate Rewards points on phone bills, internet, cable, and at office supply stores. So if you are looking for a Visa business card, I would suggest looking at one of those cards. Visa SavingsEdge provides enrolled Visa Business cardholders automatic discounts on qualifying purchases at participating merchants. Discounts require no coupons or codes, because they are applied as statement credits on enrolled Visa Business cardholders’ future account statements. As I mentioned earlier, it is very similar to Plink. They both don’t require codes or coupons, they both stack on top of portal and credit card rewards, and they both reward you for normal spending (and MS of course). You should use Visa SavingsEdge because it is another great way to make some extra money! There is nothing to it. Simply sign up, add your card, and shop at qualifying retailers. The cash back will then be added directly to your account. It’s as easy as that! Head over to visasavingsedge.com. On the right side of the screen you can enter your information. The Business name is not verified, so if you signed up for a business credit card and do not have a business, you can enter anything into this box. If you want, you can check if you card is eligible on this page as well. 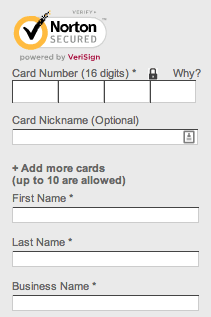 All you need to do is enter the first six digits on your card. After that, you will be officially signed up! 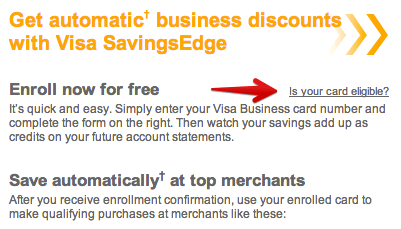 Using Visa SavingsEdge is extremely easy. You may end up using it without even realizing! All you need to do is go to participating merchants and use the credit card you signed up with to make purchases. You can find out what merchants qualify by clicking on “Merchant Offers” after you log in. There are quite a few merchant offers, so it is very easy to make use of Visa SavingsEdge. Once you find a merchant you want to shop at, select it to see the terms and conditions. I use Visa SavingsEdge primarily for Staples, which gives 1% cash back on purchases of $200 or more. Make sure you know what terms and conditions apply to the merchant you want to shop at, so you can get the cash back. Visa SavingsEdge stacks on top of all other rewards including Plink, credit card rewards, and portal bonuses. The cash back earned via Visa SavingsEdge is applied directly to your credit card statement and this happens automatically. 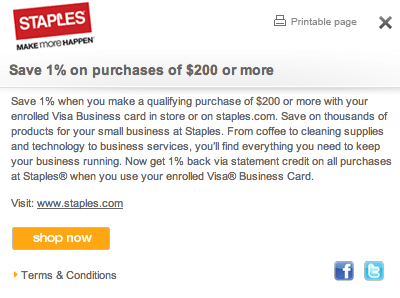 I did 10 – $200 gift card transactions at Staples recently and the cash back posted two business days after.